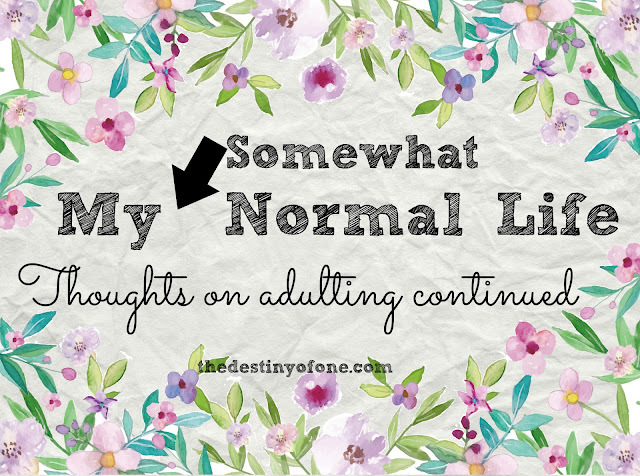 So, on Monday, I talked about how I don't like the word adulting. Of course, I also went on to use that word (you can read the post here). Since I talked about some things I didn't like about being an adult, today I wanted to talk about something this week that has made me grateful to be one. A long time ago, on a blog far away, I did a challenge regarding being content. I remember it clearly because one of my struggles was with envy of other people having smart-phones, while I didn't. I daily use my cool little phone to text, talk, and take pictures. Because I'm an adult, I can have one. It took me a long time to get my drivers license. I didn't even really want it. Now, spending an hour alone in the car is a blessing. I often use the time to worship and pray because it is one of the few times that I don't have other things pulling at me. Okay, I know you don't have to be an adult to do that. However, driving an hour to meet a friend by yourself is a pretty grown-up thing to do. Those long conversations are pretty much my favorite part of adulting. There are times that I would rather my parents make decisions for me. Yet, I often find myself rejoicing that I get the privilege of going before God, asking advice, weighing options, and then getting to make a decision. Most of the jobs I've had, you had to be eighteen-years-old to have. I've had some awesome ones. Including, my newest one helping out a dear elderly woman for 10 hours a week. Yes, I probably drink it too often. However, I can't deny that getting and drinking it when I wish has been a big perk of being an adult. What are your favorite parts of being an adult? If you are still a minor, what do you look forward to the most?